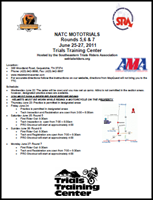 The 2011 AMA/NATC MotoTrial National Championship series (poster PDF) comes to the TTC this week for Rounds 5, 6 & 7 on June 25, 26, & 27. If you want more info then visit this page. See both the Rider Supplemental Rules (PDF) and the Rider Information Handout (PDF).